When in the plaza, you will often be able to take on missions. These missions range from answering quizzes to actually capturing Pokémon to looking for people who have answered certain things in their profile and they change each day. 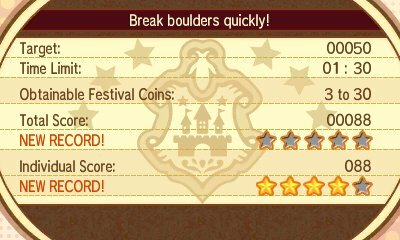 You will receive Festival Coins based on how well you do. When the mission timer is over, your points are accrued, and other players who join in have their points added to a grand total. The higher the score, the more Festival Coins will be awarded to the player. Active in my free time! Research how many people like to spend their free time out of the house. I like to go out when I’m free. Get to know your VIPs very well. Chill out in your free time? Research how many people like to spend their free time indoors. I like to stay at home when I’m free. Cross-cultural communications! Find people who use different languages than yours! English lesson! Greet people who are playing the game in English! Find big brothers and sisters! Find people who are the oldest among their siblings, and speak to them! I’m the oldest among my siblings. Find Bug-type enthusiasts! Part 1 Speak to people who like Bug-type Pokémon! Find Bug-type enthusiasts! Part 2 Speak to people who like Bug-type Pokémon! Find Dark-type enthusiasts! Part 1 Speak to people who like Dark-type Pokémon! Find Dark-type enthusiasts! Part 2 Speak to people who like Dark-type Pokémon! Find Dragon-type enthusiasts! Part 1 Speak to people who like Dragon-type Pokémon! Find Dragon-type enthusiasts! Part 2 Speak to people who like Dragon-type Pokémon! Find Electric-type enthusiasts! Part 1 Speak to people who like Electric-type Pokémon! Find Electric-type enthusiasts! Part 2 Speak to people who like Electric-type Pokémon! Find Fairy-type enthusiasts! Part 1 Speak to people who like Fairy-type Pokémon! Find Fairy-type enthusiasts! Part 2 Speak to people who like Fairy-type Pokémon! Find Fighting-type enthusiasts! Part 1 Speak to people who like Fighting-type Pokémon! Find Fighting-type enthusiasts! Part 2 Speak to people who like Fighting-type Pokémon! Find Fire-type enthusiasts! Part 1 Speak to people who like Fire-type Pokémon! Find Fire-type enthusiasts! Part 2 Speak to people who like Fire-type Pokémon! Find Flying-type enthusiasts! Part 1 Speak to people who like Flying-type Pokémon! Find Flying-type enthusiasts! Part 2 Speak to people who like Flying-type Pokémon! Find Ghost-type enthusiasts! Part 1 Speak to people who like Ghost-type Pokémon! Find Ghost-type enthusiasts! Part 2 Speak to people who like Ghost-type Pokémon! Find Grass-type enthusiasts! Part 1 Speak to people who like Grass-type Pokémon! Find Grass-type enthusiasts! Part 2 Speak to people who like Grass-type Pokémon! Find Ground-type enthusiasts! Part 1 Speak to people who like Ground-type Pokémon! Find Ground-type enthusiasts! Part 2 Speak to people who like Ground-type Pokémon! Find Ice-type enthusiasts! Part 1 Speak to people who like Ice-type Pokémon! Find Ice-type enthusiasts! Part 2 Speak to people who like Ice-type Pokémon! Find lonely people! Find people who don’t have anyone they love, and speak to them! I don’t have anyone I love. Find middle children! Find people who are middle children, and speak to them! I’m in the middle among my siblings. Find Normal-type enthusiasts! Part 1 Speak to people who like Normal-type Pokémon! Find Normal-type enthusiasts! Part 2 Speak to people who like Normal-type Pokémon! Find only children! Find only children, and speak to them! Find people in love! Speak to people who have someone they love! I have someone I love! Find Poison-type enthusiasts! Part 1 Speak to people who like Poison-type Pokémon! Find Poison-type enthusiasts! Part 2 Speak to people who like Poison-type Pokémon! Find Psychic-type enthusiasts! Part 1 Speak to people who like Psychic-type Pokémon! Find Psychic-type enthusiasts! Part 2 Speak to people who like Psychic-type Pokémon! Find Rock-type enthusiasts! Part 1 Speak to people who like Rock-type Pokémon! Find Rock-type enthusiasts! Part 2 Speak to people who like Rock-type Pokémon! Find Steel-type enthusiasts! Part 1 Speak to people who like Steel-type Pokémon! Find Steel-type enthusiasts! Part 2 Speak to people who like Steel-type Pokémon! Find Water-type enthusiasts! Part 1 Speak to people who like Water-type Pokémon! Find Water-type enthusiasts! Part 2 Speak to people who like Water-type Pokémon! Find youngest children! Find people who are the youngest among their siblings, and speak to them! I’m the youngest among my siblings. French lesson! Greet people who are playing the game in French! German lesson! Greet people who are playing the game in German! Give a message to beginners! Find people who have played Pokémon 5 years or less, and give a message to them! Greet experienced Trainers! Find people who have played Pokémon for 5 years or more, and greet them very politely! Italian lesson! Greet people who are playing the game in Italian! Japanese lesson! Greet people who are playing the game in Japanese! Korean lesson! Greet people who are playing the game in Korean! Looks matter most! Find people who value looks over personality in a person! Personality matters most! Find people who value personality over looks in a person! Research blue! Find people who have every piece of their outfit dyed in blue. Research green! Find people who have every piece of their outfit dyed in green. Research navy blue! Find people who have every piece of their outfit dyed in a shade of navy blue. Research orange! Find people who have every piece of their outfit dyed in orange. Research pink! Find people who have every piece of their outfit dyed in pink. Research purple! Find people who have every piece of their outfit dyed in purple. Research red! Find people who have every piece of their outfit dyed in red. Research yellow! Find people who have every piece of their outfit dyed in yellow. Secrets are something to keep! Find people who are tight-lipped and can keep secrets! I will keep secrets at all costs. Secrets are something to leak! Find people who have a big mouth and can’t keep secrets! I will tell secrets to people. Show off muscles! Show off how awesome you and Machamp are! Speak to people, and if enough people say you’re the best pair, you’ll clear the mission! Spanish lesson! Greet people who are playing the game in Spanish! Survey about female friends! Find people who have many female friends, and have a lively conversation with them! I have a lot of female friends. Survey about male friends! Find people who have many male friends, and have a lively conversation with them! Traditional and simplified Chinese lesson! Greet people who are playing the game in traditional or simplified Chinese! 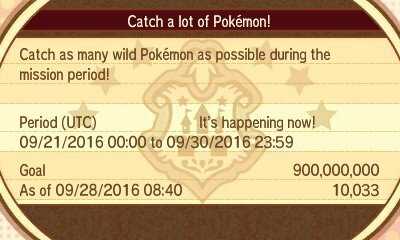 A feature that comes with the Pokémon Global Link is Global Missions. These missions are ones that everyone can join in online and can result in a massive yield of Festival Coins. They all last for a specific amount of time and vary from catching Pokémon, to beating Master Rank Bottle Royale. To access them, you need to have used Game Sync to access the Global Link. Then, talk to the woman on the right hand table in the Castle and she will check to see if any Global Missions are currently running and download them. Click here for a list of Global Missions.